This catalog covers the Amphenol MIL-C-26482, Series 2 Connectors. 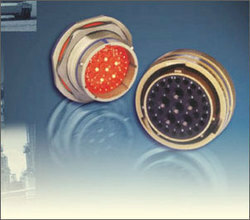 These connectors are bayonet-coupling type, and they feature crimp contacts that are rear insert able and rear releasable. They can be ordered through Amphenol, by military or equivalent proprietary part numbers. A worldwide vision connecting people with technology Amphenol is one of the largest manufacturer of interconnect products in the world. The company designs, manufactures and markets electrical, electronic and fiber optic connectors, coaxial and flat-ribbon cable, and interconnect systems. we connect the world together Amphenol is a leading interconnect solution providing company with a product portfolio of connectors, accessories, cable assemblies and system integration for almost all the applications across various industries. With connectors conforming to almost all the military and industrial standards in us, Europe and Asia, amphenol assumes the leadership in meeting the interconnect needs of military, aerospace, industrial and telecommunication market segments. Amphenol india: we connect the world together amphenol is a leading interconnect solution providing company with a product portfolio of connectors, accessories, cable assemblies and system integration for almost all the applications across various industries. With connectors conforming to almost all the military and industrial standards in us, Europe and Asia, amphenol assumes the leadership in meeting the interconnect needs of military, aerospace, industrial and telecommunication market segments.